How IN THE WORLD is this going so fast?! It seems like I just started the “20’s”, and this is my last week! Crazy! Size of Baby: According to Baby Center, about the size of a butternut squash…about 15 inches long (WOAH! ), and around 2 1/2 pounds…I would guess bigger than that though. 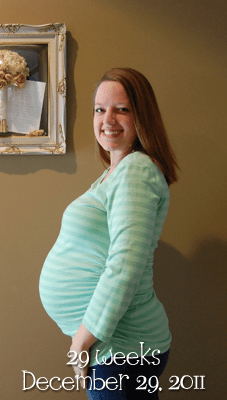 Maternity Clothes: I’ve been wearing a lot of pajama pants and big t-shirts around the house this week. But in public, definitely maternity. Stretch Marks: None! I finally started using lotion every day this week (I know, I know, I was a slacker in this department)…hopefully that will help! Movement: Girl is ALL over the place. I finally realized that I can feel her rolling around this week. And lots of hiccups too! She’s had them 2 or 3 times, and Noah got to feel them one time! Sleep: Getting weird. My dreams are off the scale crazy now, and wake me up a lot during the night (usually I’m mad or upset because something bad happened in the dream). I just wish I could cut dreams off…I think I would sleep a lot better! What I miss: Breathing this week…there are times I just can’t get a good breath because she’s sitting high! What I am looking forward to: There’s a lot in January! We’ve got classes, the national championship, (and I think) showers…busy, busy! Cravings/Aversions: I’ve noticed I can’t eat quite as much. I’ll be really hungry, but will sit down to eat and only be able to get down a few bites before I’m full! I’ve been thirsty a lot too. Symptoms: Some Braxton Hicks (especially if I haven’t had a lot of water that day or the day before), shortness of breath, and a VERY wiggly tummy. 🙂 I’m pretty sure I had my first experience with her sitting on a nerve Tuesday too…I was just fine, and then all of a sudden I had a really, really bad pain in my right hip…so much so that I couldn’t even work through the pain. It would hang around for about 15 minutes, then go away for a few minutes, then come back again. This kept up for most of the afternoon. Needless to say, that wasn’t fun, but I finally found a comfortable position to lay down and put a heating pad on it, and it eventually stopped.